I must admit, I was a bit skeptical about my first visit to Dubai. In fact, I wasn't gung ho on spending time in the Middle East, and I wasn't even sure I'd like anything at all about Dubai. But, after spending two days there, I am more intrigued than ever and can't wait to return to see and do more in the UAE!. Everything about Dubai--with the exception of the original "souks"--is shiny, sleek and new. The architecture of the skyscrapers lining the harbour, the new "downtown", and the beaches are unlike anything I've seen in my world travels. Each office, apartment and commercial building is taller and more stunning than the next, and the hotels are designed with unbelievable style and flair! Boasting the world's tallest building (Burj Khalifa), the largest manmade island, the priciest hotel suite, and by far the biggest shopping mall, Dubai is definitely ALL about extremes. It's also a gorgeous example of a modern city filled with world-class hotels (including Armani's first and soon to be two in the city by Ritz-Carlton ), incredible restaurants, amazingly friendly people and overall, just a fantastic vibe. Not to mention, the shopping is outrageous. When the mall steps from your hotel (The Address Downtown)has 1200+ shops, there's no other way to describe it. Not to mention, The Dubai Mall also has indoor ice skating, an underwater aquarium where you can swim with the sharks, a themed Sega adventure park and dozens of fabulous restaurants. It overlooks a dancing fountain that puts Bellagio in Vegas to shame. And of course, there's also the Mall of the Emirates if you prefer to indoor ski or shop at Harvey Nichol's while in town. Highlights of my recent visit of course included a stay at the much-buzzed about Armani Hotel Dubai. This is THE place to stay in Dubai if you're moved by fashion, technology, service and ultra-sleek style. All of our Virtuoso clients booked at the Armani enjoy complimentary passes to the TOP of Burj Khalifa, the 160-story, 2700-foot-high skyscraper with the highest outdoor observation tower in the world. I also absolutely LOVED The Address Downtown, just a few blocks away from the Armani. It's perfect for families as well as clients wanting a true luxury resort (the infinity pool is stunning) and business travelers desiring well-appointed spacious rooms and suites. The staff and service at The Address Downtown is up there with the best in the world, and sending us off to the airport in a Bentley was also a nice touch! The only problem I had with Dubai was too little time to see and do it all. Shopping was certainly fun, but next time I'll be trying a desert safari, dune bashing, camel riding and maybe even sand boarding, as these activities are at your doorstep in Dubai. I'm also hearing a lot of great buzz about the new Banyan Tree Wadi Rum and I'd love a few days to totally chill by the Arabian Sea at Six Senses Zighby Bay in Oman. With nonstop flights on Emirates now available twice-daily from LAX, I'll definitely be planning a return visit to the UAE soon! 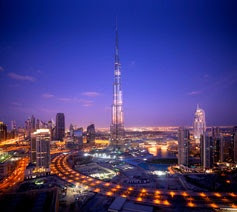 Want to know more or plan your own trip to Dubai? Contact us at 310.979.9036 or via email stacy@elitetravelinternational.com. incredible! i've always wanted to go to dubai! still haven't managed to find the time to go there yet. but it's still one of my top ten places to visit! If you are travelling to London than you can try Hummingbird Cars http://www.hummingbirdcars.com I have tried them For London airport Transfer and they are pretty good and Affordable. They Provide Transfers from all the five London Airports: Gatwick, Luton, London City, Stansted and London Heathrow Airpots. They have very well behaved Drivers who respect their customers. They also provide a MEET and GREET Service. They have well maintained Saloon, Estate, People Carriers (MPV's) and large Public Carriers. In addition to this they offer good discounts on bookings. Ton Sai Bay Ao Ton Sai is where most of the action is; be it restaurants, bars, hotels or guest houses. Most tourists stay at Ton Sai Bay because of the convenience. Serviced offices or Business Centres offer spaces for small to medium sized companies which are fully furnished, IT infrastructure is provided from telephony to internet , Service Offices Dubai. Our Property Management services offer the perfect solution for your Dubai property. We take the everyday headaches out of being a landlord and research shows that more tenants are willing to renew and pay a higher premium for properties which are professionally managed, Property Management Dubai. Serviced offices or Business Centres offer spaces for small to medium sized companies which are fully furnished, IT infrastructure is provided from telephony to internet, Serviced Offices Dubai. yes you are right DUBAI is completely city of extreme, i live in dubai and i like dubai so much.